Jim explains to Lucy and Scott that Douglas has robbed them of a lot of money. Max tells Kate that Danny isn't his real son. Danny overhears and is shocked. Des is making an omelette when Daphne comes in looking pensive. She studies Des's face for a while and eventually he feels her gaze on him and asks what's going on. DAPHNE: You're going to make some girl a great husband, you know that? DES: What me? No way. Been there, done that. I'm quite happy to be a crusty old bachelor. How about you? Daphne evades the question and tells Des that Shane has asked her to move in with him - in their own place. Des stops dead in making his omelette and looks a mixture of shocked and disappointed. DES: Is...is he going to marry you? DAPHNE: No. That's not Shane's style! DES: Well, it's up to you and him, but...at least you love him. DES: It's funny, we've never ever said that. I love you, too. And I want your happiness. He goes back to making his omelette. He offers Daphne to share his lunch. The phone rings and Daphne answers it to Shane. He says he'll drop over, but Daphne refuses permission - she wants to talk some things over with Des. Shane doesn't understand why she has to do this, but she says she'll call him later. DANNY:(angrily) You knew, didn't you?! You know about the old man really not being my father. SHANE: Who told you that? DANNY: I overheard Max blabbing it to Kate Drew at the Coffee Shop. Danny wants to know who his real family are. Shane says he doesn't know. Danny says it all makes sense now - why Max yelled at him for all those years. He demands to know if Maria is really his mother. SHANE: Course she's your mother, and I'm your brother! Now just calm down. DANNY: All my life, I trusted you! And you and mum let him treat me like that. You knew the reason! Shane tells him he only found out when Max and Maria split up - when Scott and Danny had run away to the country. DANNY: Is that why they split up? Over me? DANNY:(tearfully) Let me tell you something, Shane. I'll never accept him! Never! Des and Daphne are having a cup of coffee at the living room table. Daphne is very pensive. DES: Hey, come on, cheer up! It's meant to be a celebration. DAPHNE: Des, I haven't told Shane that I'll move in with him. I said I'd think about it. She asks what Des is going to do, and Des says he'll have a look round for another lodger. DES: I'll tell you one thing. I'll never find another girl like you, Daphne. A bit of a moment comes between them, but Des breaks it by offering her another coffee. 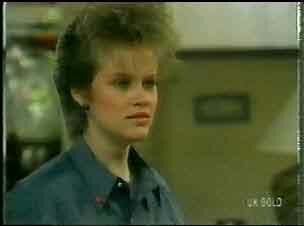 Presently, Daphne gets up and walks over to the counter. DAPHNE: Des. Will you kiss me? DAPHNE: I meant, kiss me properly. DAPHNE: Because...you kissed me one night and I often think about it. DES: Yeah, well...I think about it too. (nervous) You're Shane's girl. DAPHNE:(firmly) I'm no-one's girl. Will you? He kisses her, gently at first but it soon because a full-blown pash with them wrapping their arms around each other. Eventually Des breaks away, not looking very happy. DES: This isn't doing any of us good. DES: We shouldn't have done that, Daphne. We shouldn't have. Lucy tells them that Terry is on the front page of all the newspapers she's delivered. She says she can't face the kids in school, but Scott tells her that they have to keep defending Paul. Max comes in in a state looking for Danny, saying he's been gone all night. Scott doesn't have any ideas about his whereabouts though, and neither do Jim and Helen. SHANE: I told Dad you found out. SHANE: We care, Danny! I think the best thing to do now is for the three of us to sit down and just talk this out. Just then, Max comes in through the back door and Danny puts on a deep scowl. They face off in the kitchen. MAX: Oh. Back, are you? MAX: Listen, next time you're going to stop out all night, let one of us know, will you? MAX:(upset) Cos I got better things to do than sit up all the night wondering where in the hell you are, is why! DANNY: Oh! I bet you have. Like telling the whole street I'm not your son! MAX: Oh. That's what you think is it? Shane intervenes at this point and tells Max about his suggestion that the three of them sit down calmly and talk about things after work tonight. MAX:(quietly) Yeah. Yeah, yeah, you're right. DANNY: Well, I'd better get ready for work. But you can forget about talking about anything tonight. Cos I'm just going to be back long enough to get my things and move out. Max sits down at the kitchen table and looks upset. MAX: Last way I would ever have wanted him to find out was that. SHANE: I'll see if I can have a word with him today. MAX: Yeah...yeah. Tell him - you know...(trying not to cry)...it's his home. We're his family. He walks out of the house, looking very upset. SHANE:(to no-one) I'll do what I can, Dad. Des is just writing Daphne a note when she comes out. Neither of them have slept a wink. DES: What made you do a thing like that, Daph? DAPHNE: I had to find out something. When Shane asked me to move in with him, all I could think about was you. DES: I told you last night, I'm the last person you should consider. I think you should move out, Daphne. DAPHNE: I want to stay with you, Des! DES: No, no. Not after last night, it wouldn't work. Things won't be the same...you'd better make other arrangements, OK. He leaves for work. Daphne starts to cry. Then she fetches the letter that her grandfather wrote her and opens it. 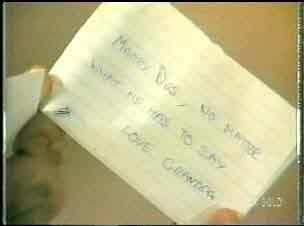 It reads, "Marry Des, no matter what he has to say. Love Grandpa." DAPHNE: Easier said than done, Grandpa. Paul is sitting up in bed now, but he still looks gutted. Jim has come to see him. Paul says he keeps flashing back to Terry holding the gun. Was she trying to kill him or stop him calling the police? Jim advises him to try not to think about it. Paul asks after Helen, and Jim says she's still very upset about Douglas. Jim says they'll all survive - as a family they all love each other and that will never change. JIM: Together, we can take on the world. Helen answers the door to the lady from the art gallery. She has come to discuss Helen's paintings - they all love them at the gallery, and hopes Helen will do a second exhibition. Helen tells her that her circumstances have changed, and she's looking to sell a couple of paintings if she can. The lady tells her that there won't be a problem with that - it seems her works have been selling very well through the dealers. Helen is shocked to hear this, and the lady explains they're in great demand. Daphne is moping around the coffee shop, deep in thought, when Shane comes in. He says he's brought the keys to the place, but Daphne says he's jumping the gun. SHANE:(deflated) You're not moving in with me, are you? DAPHNE: No. And it's not because I don't think the world of you - I do. SHANE: And you know I think more of you than any other girl I've ever met? SHANE: If I asked you to marry me, would that make a difference? DAPHNE: No. This past week's been a turning point for me. I want to get married, but it's going to have to be to someone I really love. SHANE: And what we have isn't love? DAPHNE:(kissing his cheek) What we have is a warm, loving friendship. No-one can ever take it away from us. SHANE:(dejected) Right. (Trying not to cry) Hope you find the guy you're looking for. The scene cuts to Des walking towards the bank, deep in thought. His reverie is broken by Danny who asks him if he can leave a bit early today. Des says it's only 3.30pm, but Danny can go as long as he doesn't make a habit of it. Scott is helping Helen to assemble her paintings, ready for the lady (Mrs McKinley) to take away to sell. Danny comes round and asks Scott for a word. Danny tells Scott that he's moving out of home, and he wants Scott to come with him. He says they can find a place and split the rent. Scott says he doesn't want to move out. Danny reminds him that they had a good time when they ran away to the farm, but Scott says things are different now - Paul isn't well and Danny is getting on better with Max. DANNY: He's not my father. Shane comes in looking fed up and sits down heavily in the living room chair, trying not to cry. Danny comes out. SHANE: Do you want to move in with me, Dan? SHANE:(strained) It didn't work out. SHANE:(wiping his eyes) There's something I'd like you to do before we go though. Say thanks to the old man, will you? SHANE: Because he gave you a home and an education, that's why. DANNY: Yeah. And yelled at me, day and night into the bargain. SHANE: Look, this might come as a bit of a surprise to you, Danny. But the old man really got knocked for six when he found out you weren't his son. And then when mum went away with Richard Morrison, what did you do, hey? You dug your toes in and yelled that you wanted to stay with him. You put Dad in a position where he had to decide to give you a home. Even though he knew that Mum had walked out on him and that you weren't his son! The least you can do is say thanks to him for that, Danny! Lucy has made dinner - she says she's going to do the housework so that Helen can paint(!) Helen tells Jim that her paintings have been selling - and she's going to give Jim the money to start paying off the debt. The house can be saved! Max comes in and finds Danny sitting on the living room sofa. DANNY: Dad. When Mum went away, why did you keep me? MAX:(surprised) Cos this is your home. DANNY: But you didn't have to keep me. MAX: Yeah, I-I know, I...I know, I tell you, I thought about it a lot. Anyway...(sits down with Danny) want to know what I came up with? That you're just as much my son as Shane is. Now, it doesn't matter whether you move away from here or not. Far as I'm concerned, as long as you live, this is your home, and I'm your father. Now, I know I yell at you and we fight and that. Just the way we are. But...underneath it all, I tell you, I love Shane...(starts to cry)...and I love you! DANNY:(hugging him) Oh, Dad. And I love you. Daphne has made Des a candlelight meal. DAPHNE: I guess you could call it a sort-of celebration. Des laughs nervously and looks confused. DAPHNE: I know you said you'd never ask another girl to marry you, but...can't stop a girl from asking you. Will you?